Happy, Happy New Year my friends! It's been a long time! I do hope your holidays were filled with family, friends, fun and lots of good food; that you made many memories and found some time to relax and nourish your body and soul. We had a wonderful holiday…mostly relaxing…with a quick trip to Disney thrown in for sheer fun. Note to self: NEVER, EVER GO TO ORLANDO AND DISNEYWORLD THE WEEK BETWEEN CHRISTMAS AND NEW YEAR'S! Holy cow…talk about insanity…but we still had a fantastic time. We were able to see a couple of movies…All The Money in The World was interesting and sad at the same time. And while I enjoyed the new Star Wars movie, the real Star Wars aficionados in my family were a little disappointed. We returned from Florida just in time for the ‘Bomb Cyclone' last Wednesday…today will make the 4th day that school has been cancelled as a result; our roads are still sheets of ice and the southern states and drivers just aren't equipped. I'm a little worried about my garden, I've never had to deal with snow and ice during the winter growing season. 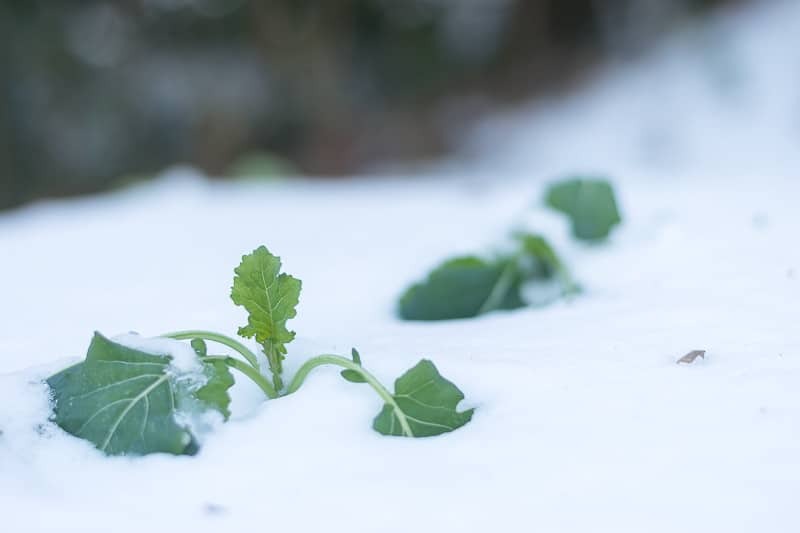 I'm thinking we'll get a thaw started today so I'll be able to check out my wee veggies. A little introspection and reflection is a good way to appreciate all your achievements of the past year. I am (sometimes) all about big, lofty resolutions but sometimes just some little changes are all you need. For my creative friends out there…does your creative space need uncluttering? Did you watch The Crown? We so enjoyed that series and can't wait until Season 3. Did you know that the actress who plays the Queen (Claire Foy) will be replaced for the next season? The director wants an actress closer to the age of the Queen during the time period portrayed. I so loved her in that role, but understand where the director is going. Anywho, want to see the similarities between the Royals and their respective actors/actresses for seasons 1 and 2? In addition to great memories, we brought back a cold from Florida! What's up with that? In any event, this list of healing and nutritious soups has my name all over it. Just need to chose which one I'll make first! Do you get antsy to declutter this time of year? I know I surely do. Some tips for easy, ongoing, every day decluttering. Well my dears, it's good to be back chatting with you! How was your holiday? Drop me a note. I'll ‘see' you on Wednesday! Our holiday was great, we got a deer so I learned how to make jerky and it was amazing. Had a great visit with our son and discovered a simplistic Christmas agree’s with us… Goes beyond words was nice and relaxing. Sounds like you had fun – enjoyed your photos on Instagram. Saw Star Wars too and it just may have been my favorite yet. My family has turned me into a geek I guess because I’m enjoying sci fi something I never thought would be possible. For the garden some Plants are stronger than we think and I wouldn’t be surprised if that broccoli makes it. After the snow is gone I would get some mulch to help warm up the soil so it can recover. Hope your week is a great one. Happy New Year my friend!I am so glad your holiday was so relaxing…but knowing you that probably means you cleared several acres! I know…I really liked Star Wars…so I was really surprised when my boys pooh-poohed it! Keeping my fingers crossed on my garden…still under several inches of snow…believe it or not! This is Southeastern North Carolina for heaven’s sake! Will definitely put some mulch down..thanks for the tip. Hi Pam…you are truly a neighbor…good to ‘meet you!’ I was hoping to get a little more of a thaw today…my garden is still under a couple of inches of snow…keeping my fingers crossed. I need to check out Varnamtown…are you close to Myrtle Beach? I do polish my silver…did it all before Christmas. i started cleaning out my fridge and freezer, worked on a painting and enjoyed hanging out with the family. I am so very glad to have you on the other end of my posts! Thanks so much for popping in and introducing yourself. Hope you have a fantastic week. It would be such a shame to replace Claire Foy. She is absolutely marvelous. I was up until 2am this morning watching the last of Season 1. Can’t wait to start Season 2. First time reading your blogs. Enjoyed it. Hi Janice…I know..I was crushed to hear that Claire wouldn’t be back next season! She is fantastic…I’m still working on my imitation of her! Such a fantastic series. Have you started watching ‘Victoria’ as well? It’s a good one too. I am thrilled to have you here and looking forward to hearing from you in the future. Wishing you a wonderful week. Happy new year! I enjoy your blog. And a most Happy New Year to you as well! It thrills me to no end to hear that folks enjoy reading my blog! I do have a fun time creating and writing, but it wouldn’t be worthwhile if there weren’t folks like you on the other end. Thanks for taking a precious minute to let me know that you are enjoying it. Wishing you a fantastic week. Aw Mary, you made my day! I so appreciate you taking the time to share your kind and encouraging words! I have a ball creating and writing, but it’s so much more fun knowing that the folks on the other end are enjoying it. Wishing you a fantastic week my friend. You recently had a Facebook post on washing a cashmere jumper. I followed the instructions and it worked perfectly Using the towel to absorb the excess water was excellent. Used the method to wash other articles like my daughter’s unicorn cosy slippers!! Keep up the good work? I so appreciate you writing in to let everyone know that that sweater washing tip worked so well for you…especially for those Unicorn Slippers! I am sure you would have been in a world of hurt if you harmed those treasures in any way. Wishing you a FANTASTIC weekend my friend. Not a bother Lynn, those unicorn slippers would you believe belong to my 18 year daughter, still a princess, lol!!! Hi there, I’m Lynn and I’m in my happy place when cooking, baking, creating, crafting, diy-ing or gardening. You too? Hey, we should be friends! You can reach me at [email protected] and read more about me here.